The last-ever Morningside Mile will be run at noon on Sunday, March 26. Help make it the fundraiser that pushes the fundraising campaign over the finish line! 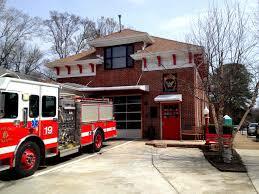 We are $15,000 from reaching our goal of $120,000for the restoration of our Fire Station 19. The finish line is in sight, but we can’t get there alone. Please register to run (or walk), spread the word, and encourage others to join you. 100% of race profits are donated for the safety of our neighborhood heroes, and to help keep it in service for future generations. Not able to participate in the race? Head straight to the Block Park at Morningside Village (1424 N Highland Ave) to meet your neighborhood firefighters and enjoy family fun for all ages! The party is from noon – 2:00 pm. Invite your friends & family to cheer you on & enjoy the festivities. Neighbors are encouraged to “go green” and walk or bike to the event. More information and the link for registration may be found here. Check back regularly for an updated list of festivities. You can also visit the Morningside Mile Facebook page.